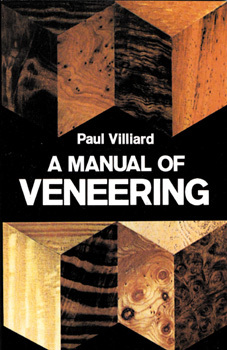 Dimensions: 5 3/8" x 8 1/2"
This is a clear, well-written manual on the craft of veneering that shows you how to turn out your own hardwood veneers beautifully and economically. With this fully illustrated book you will learn how to make your own veneer press and edger at a fraction of the cost of commercial models. After that you are given all the techniques: how to match veneers, how to glue, clamp, tape, and edge veneered panels, and much more. For anyone wanting to fix up old veneered furniture, the detailed chapter on repairing veneers is worth the price of the book! Veneering is an ancient craft, and when you select the wood yourself and do your own construction, you can be sure that the veneers you make will retain their beauty for years. This excellent, comprehensive book will give you all the expert instruction you need.